In 2011, the Institute of Cultural Affairs (ICA) launched a citywide project called accelerate77, aimed at accelerating grassroots sustainability initiatives throughout Chicago’s 77 community areas. The project did this by identifying the initiatives and connecting them to one another, resource providers, and policy makers in a city-wide Sharing Approaches that Work Conference. 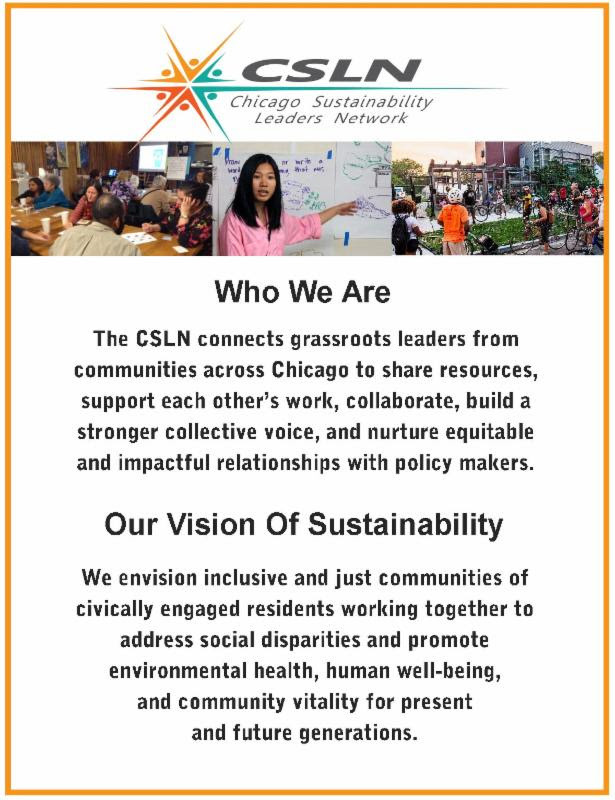 The accelerate77 project has led to the formation of the Chicago Sustainability Leaders Network (CSLN). As the organizing sponsor of the network, ICA is currently engaging members of the CSLN, a network of local activists and community organizations/organizers throughout Chicago, in collaborative change making efforts. Chicago Sustainability Leaders Network (CSLN) meets again on Thursday, May 16th at The Plant, a "collaborative community of food businesses looking to revalue their 'waste'". Thank you Plant Chicago for hosting us! Come learn about this hub of innovative and sustainable projects and the work of Plant Chicago. Then help the seeds planted in our March meeting sprout into new collaborations and initiatives! CSLN's first meeting of the year carried a sense of new energy with a host of familiar names and faces among the 24 who gathered for our March meeting at Windsor Park Evangelical Lutheran Church. Goal: Engage residents in holistic sustainability and grow peer-to-peer relationships through collaboration. Discussion: The group is working on developing ideas for an intergenerational event series as a follow up to last year's Nourish (comm)Unity series. Goal: Showcase member sustainability work and resources and articulate the impact of CSLN as a network. Discussion: The group agreed to focus on member-to-member connections with an asset-based lens, seeking what members need and have to share. The goal is to create a nimble database and timely connections. Goal: Nurture the "in-between space" of collaborative governance where community initiatives intersect with municipal efforts for change. Discussion: The group is identifying strategies for engaging with an incoming mayoral administration, as well as with aldermen at the ward-level. CSLN Business Cards are Here! Members at the meeting suggested that it would be beneficial to outreach on behalf of CSLN at community events. We created CSLN business cards to help with this exact situation! 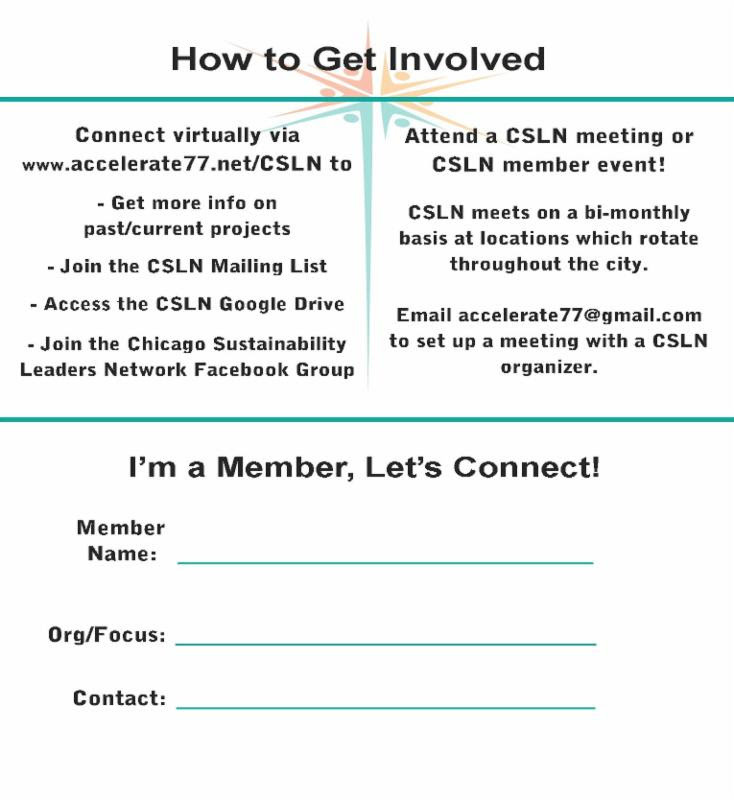 If you are hosting an event, networking, or talking to members of your community, we encourage you to use these printable business cards to invite others to learn more about and join the CSLN.